They’re compatible with widgets. In a word, widgets are wonderful. Hybrid Core is more of a theme framework, or parent theme that can be modified endlessly to create the perfect child theme, than a theme to use straight out of the box. But don’t let that description intimidate you! The theme is crazy-easy to use and very user-friendly. It’s SEO-ready. Hybrid is completely ready for search engine optimization (SEO). It’s highly customizable. Hybrid has 15 custom page templates for you to choose among. Each custom page is set up slightly differently, giving you an array of options. It’s widget-ready. Hybrid has multiple widgetized areas for you to drop content into, making your WordPress theme experience easy and efficient. You can read about the Hybrid Core theme at developer Justin Tadlock’s website. 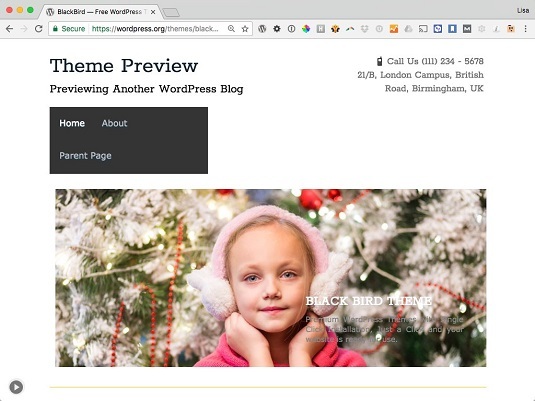 You can also download and install the theme directly on your WordPress website by using the automatic theme installer built in to your WordPress Dashboard. Hestia is a one-page theme built for use on a small-business website. The theme works on all devices: computers, tablets, and smartphones. Responsive design is all the rage right now because of the emergence of mobile and tablet browsing. Responsive design ensures that a website looks perfect no matter which device a reader uses to view it. The Responsive theme by Emil Uzelac features nine page templates, including Blog, Blog Summary, and other static page templates built on a fluid grid system that adapts to the user’s browsing environment. Theme options include webmaster tools, logo management, Google font typography support, social media icons, navigation menus, and multilingual support. You can easily see the Twitter-esque inspiration behind P2 by looking at the post text box at the top of the theme. As on Twitter, users can post quick updates, and logged-in visitors can leave feedback on the updates. All this happens from the convenience of the front page of your site; visitors aren’t required to click through to a different page of your site, locate the comment form, type, and submit the comment. Annotum Base is a scholar’s blog theme that provides a complete open-access journaling system, including peer review, workflow, and advanced editing and formatting for blog posts and pages. The most interesting features in this theme include structured figures, equations, and cross-referencing from PubMed and CrossRef (including reference importing). Customize featured text with an easy-to-use widget. Customize background colors and/or images. 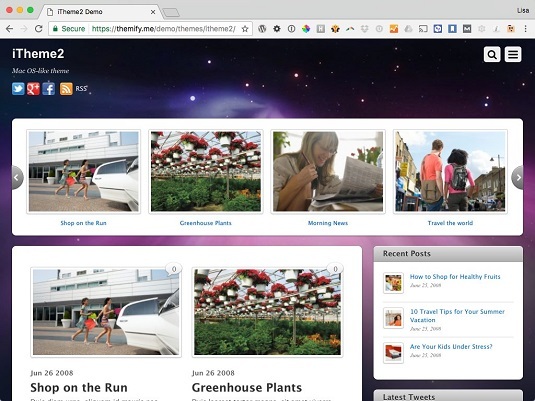 Incorporate post thumbnails by using the WordPress featured image feature. Use the navigation-menu features of WordPress. 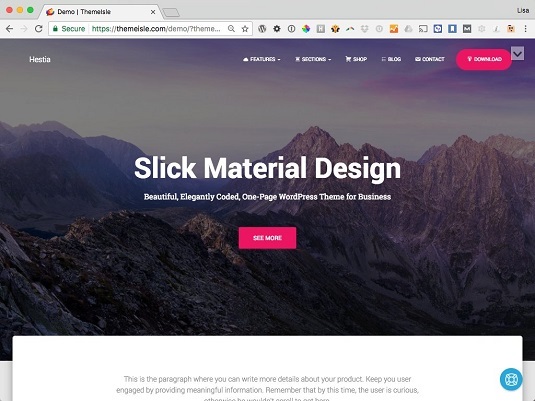 iTheme2 is a WordPress theme designed with Mac lovers in mind. The theme emulates the design elements and features of the Mac operating system, with beautiful blue gradients and Mac-like menu headers and icons. Esquire is a free WordPress theme created by Automattic, the company behind the WordPress.com hosted service. It has a distinct visual design with creative typography (fonts), a two-column layout, and creative design elements such as the date format and content styling. Esquire supports all the expected default WordPress features, such as featured images, custom background, custom header, navigation menus, and post formats. The theme’s design was inspired by the art direction of Esquire magazine. Nisarg is a beautiful theme for a blog. It features a nice, clean layout with easy-to-use navigation menus, a large area for you to insert your own custom header image, and support for custom backgrounds and colors. The Nisarg theme provides custom page templates (such as no-sidebar templates, portfolio, and blog) and allows you to use default WordPress features such as custom headers, custom backgrounds, navigation menus, featured images, and post formats. 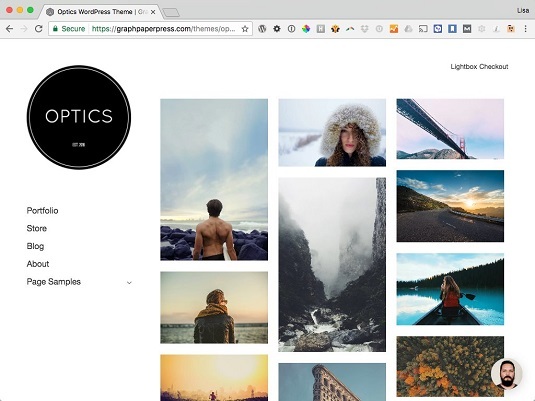 Optics is a minimalist WordPress theme featuring a grid layout. The theme has clean, simple, light elements that let your design focus on content rather than appearance. The theme uses black, white, and gray tones and a two-column layout, with content on the right and sidebar on the left. This free theme is offered by a commercial theme company, Graph Paper Press, and to download it, you need to register for a free account on the Graph Paper Press website.